There’s something very appealing about the personality of white gold. As valuable and costly as its yellow or pink siblings, white gold downplays its precious metal character, looking to the uninitiated almost exactly like stainless steel. That means any pieces of jewelry, and watches in particular, made in white gold are typically worn by people completely comfortable in their own skin; those who can afford the very best, but who feel no need to shout about it. Class acts, in other words. Rolex has been using the metal in their designs for decades, and even have their own foundry in the Plan-les-Ouates base in Geneva where they forge a proprietary 18k alloy. Unlike practically every other manufacturer in the industry, Rolex do not rhodium-plate their white gold to ensure its luster. Instead, they add a palladium/silver mix that keeps it looking radiant, long after the electroplating of lesser pieces has started to wear off, revealing the yellow metal underneath. Rolex white gold stays white. Here at Beckertime, we have a wide selection of some of the brand’s most timeless models available in the shimmering beauty of white gold. Below, we’ve highlighted a few of our favorites. Although white gold is an obvious, if understated, choice for a dress watch collection, using the metal as the basis for any of Rolex’s extensive professional timepieces seems like something of a contradiction. While it may have the appearance of ultra tough steel, gold is by nature a soft metal, not up to the rigors of a life spent underwater, competing in sailing regattas or timing laps in an endurance race car event. Nevertheless, the Daytona has had a gold option for many years. The original series received a very limited number of yellow gold references, but it wasn’t until the second generation emerged in the late eighties that the world’s most popular chronograph adopted a white gold façade, in the ref. 16519. It was the final step in taking the watch away from its tool-like origins and planting it squarely in status symbol territory. Suddenly, the ugly duckling that couldn’t even be given away for the first quarter century of its existence was instantly the most sought after, waiting list-building creation in horology-land. It wasn’t all down to its new shiny white suit of course. The biggest driver of all this incredible success was, fittingly for a track day watch, a change of engine. The manually-wound Valjoux movement which had powered the Daytona since 1963 was banished in favor of the self-winding El Primero caliber from Swiss ébauche manufacturer Zenith. Rechristened the Cal. 4030 by the time Rolex’s engineers had stripped it to the bone and rebuilt it to their own specs, it was the catalyst for everything that came after. Today, the Daytona is still the mechanical chronograph by which all others are judged. That first Zenith-powered white gold example became available in several different dial colors and with various diamond and ruby accented elements, spreading its appeal far and wide. The current range has been supplemented even more, with white gold pieces topped with Cerachrom as well as metal bezels, engraved with the renowned tachymeter scale, along with the option of a rubber Oysterflex bracelet to give it back some of its sporty pretentions. 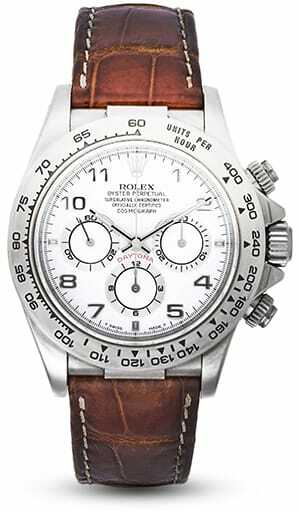 Ironically, with the enormous demand for the modern steel Daytonas putting a hefty premium on their price on the pre-owned market, a white gold example can be had brand new for a relatively modest additional sum—almost identical in looks and without the inconvenience of waiting for your name to reach the top of a list. A stunning watch in whatever guise it comes in, and supremely capable, the Rolex Daytona is an all-time classic of fine watchmaking. That most decadent of all Rolex offerings, a Day-Date in white gold is more about simple elegance rather than the overt grandiosity of a yellow or rose gold piece. It is as close as you will get to seeing what the President would look like in stainless steel. The universally recognized symbol of success and achievement has only ever been forged from precious metals—there has never been so much as a Rolesor example to distract from all that luxury. The Day-Date was released in 1956, instantly taking the flagship crown from the Datejust launched a little over ten years before. What, for Rolex, is a complicated watch, it became the first automatic timepiece ever made to display both the date and the day of the week written out in full. Now into its seventh decade of unbroken production, it has carved out a place for itself as the ultimate in aspirational symbols. The great and the good, the famous and infamous have all worn a Rolex Day-Date. It is the chameleonic nature of the watch that has won it such a diverse client base. With fans ranging from heads of state through to hip hop moguls, the Rolex President has catered to them all with a variety of styles so numerous they are impossible to count. Even the discreet nature of white gold can be granted look-at-me status when topped with extravagantly colored dials and gemstone-enhanced bezels. Rather than competing with each other, these dispirit elements work together, creating a balanced whole. Perhaps the biggest selling point for the President is the unchanging nature of its design. Particularly in its traditional 36mm guise, an example from the 1970s looks almost indistinguishable from a modern day version straight from the Authorized Dealer. The major difference is in price. You can join that exalted club of owners with a surprisingly small outlay, and still be wearing one of the most iconic watches of them all. Whether you embrace white gold’s low-key nature and pair your Day-Date with a neutral dial, or go all out for eye-catching, colorful flamboyance, there are enough versions out there waiting to suit every taste. Another watch with the sort of character that doesn’t immediately seem to lend itself to the luxuriousness of white gold, the Submariner was originally the epitome of rough and tumble adventure companion. Yet, while James Bond would certainly have baulked at it, the modern Sub is far more likely to be worn around a water cooler than on secret underwater missions. Though yellow gold has long played a part in the Submariner story, a white gold version is a fairly recent occurrence, and it forms one of the most distinctive pieces in the whole range. It actually followed on from a watch Rolex released to celebrate the Sub’s 50thanniversary. For the first time, they fitted a colored bezel to their all-conquering steel dive legend—a bright green surround that quickly earned it the nickname the Kermit. When Kermit proved himself a popular break from the monochrome norm, Rolex carried on the theme a few years later in 2008 when they brought out the white gold ref. 116619LB, with a stunning blue bezel and dial to match. Just as swiftly garnering its own unofficial handle, the Smurf, it has been a standout success for the already ludicrously popular icon. It is the perfect example of white gold’s conflicting nature. Looking like the ultra tough steel you would expect to find in a watch capable of surviving a plunge to the depths, only the more well-informed brand experts recognize it as the more lavish version, thanks to its unique coloring. Although it would be a rare person to use an 18k gold watch, of any flavor, as a dive timer, the Smurf is still very capable if needs be. In fact, more than most. The royal blue bezel is now in Rolex’s proprietary Cerachrom, an unbreakable ceramic that won’t fade under exposure to either UV light or, crucially, seawater. The Triplock crown secures the Sub to 300m underwater and the Maxi dial, with its extra large lume plots on the hands and hour markers, gives the watch a superior legibility in low light. The Oyster bracelet comes complete with the ingenious Glidelock system that allows it to be micro adjusted to fit securely over a wetsuit, and inside, the whole show is run by the legendary Cal. 3135—the impregnable workhorse that has been powering the best of the best for the last 30 years. In all, there is nothing else quite like the Rolex Submariner. And for a touch of subtle one-upmanship, not as blatant as a yellow gold piece, the Smurf is hard to beat.